The former Streamline Art Deco Launceston General Hospital was a stunning example of Modernist design aesthetic in the Northern city of Launceston. Designed in the 1930s the hospital was in use up until the 1980s when the new (current) hospital was built opposite. For some time though both new and old hospitals were used in tandem until the new hospital was totally up and running- both the old and new were connected by a stunning piece of design engineering in the form of a suspension bridge that spanned Charles Street. Eventually the grand Art Deco hospital that was operational for nearly 50 years was permanently closed down and with it went the air bridge and the once modern hospital fell into disrepair. The abandoned Launceston General hospital stood abandoned for many years - I captured this photograph in 2007. Here you can see the air bridge that connected the old hospital with the redeveloped hospital (current) I enjoy this photograph as it shows how even the current hospital has evolved and changed so much. This viewpoint today looks completely different. I also love when people are in photographs too as it provides a glimpse into fashions and the way people appeared in a certain time in history. By the time I started to take an interest in documenting the old hospital (around 2007) it was in a sad state of decay and had been heavily vandalised, with nearly all the windows smashed and people squatting inside. The only thing being used was parking for hospital staff, but eventually even that was chained off and a no go zone. I remember rubbish being strewn across the car park and weeds growing amongst the mess. I remember being drawn to the sheer size of the building and how neighbouring spaces and places were operating as usual, but there was this massive impressive hospital that was once a beacon of modern design and healthcare that looked like it was out of horror movie. These were my early days of getting interested in learning how to make photographs and it was around that this time that I’d brought my first SLR camera. I was always drawn to looking at and capturing architecture, especially from the Modernist 20th Century period, having grown up as a child in Far North Queensland the place was full of stunning designs from this period. I guess childhood memories are strong... they come back in the form of creativity and imagination through artistic pursuits. I also love how abandoned places were once new, and how in such a short period of time they become the opposite - disused and unloved. It makes me wonder in my lifetime what I will see being built and when I am old what will be abandoned. The entire process of new/old/decay and death of buildings makes me think how we are just specks in time. The old hospital was one of my first major projects documenting Tasmanian 20th Century Modernism. The wonderful open verandas, steel frame windows and of course the striking main external staircase. Hospitals fascinate me as they are like cities within cities. So many buildings and extensions from all periods of time. Especially those streamline hospitals from the 1930s - 1950s era - they are some of my favourite designs. It was not until I started researching more about the history of the hospital that I found out that the original main design was later added when an entire wing was added. I remember seeing old photographs of two sets of wonderful staircases, and a hospital that looked familiar but different to how I saw it. It was as if it was Launceston, but maybe it wasn’t. Going through archives showed me that it had indeed changed and been added onto. In fact the Art Deco hospital replaced a massive 1800s hospital on the same site. This process of learning about history through archive photographs fascinated me and continues to do so to this day - its so important to be immersed in what I do to fully understand and create my own photographs with meaning. This process of exploring, documenting and researching put me in good stead for what would become my obsession with documenting places. My photography is informed by researching archives so I have a deeper understanding of how a building site changed over time. Here we can see the old hospital that was demolished for the 1930s hospital. Tasmanian Archive and Heritage Office: PH30-1-2 Photographer, William Cawston. A view of the abandoned Launceston General Hospital I captured before redevelopment in 2007. Note the stunning spiral staircase which was demolished as part of the redevelopment. The current hospital can be seen in the foreground. From the same vantage point as the above photograph, but captured in 2009 as the Launceston General hospital undergoes redevelopment into flats and hotel. Note the staircase has been removed since taking this photograph. After standing abandoned for a very long time, the old hospital was eventually converted into flats and a hotel. This started happening around 2009 and I documented this process of the buildings second lease on life. Places change and people soon forget what once was, but through photographs a moment in time is captured forever. I remember a friend contacting me when I was away to let me know that the iconic staircase was being demolished. I made a special trip back early to Launceston to capture the process of those stairs being demolished. One last goodbye. 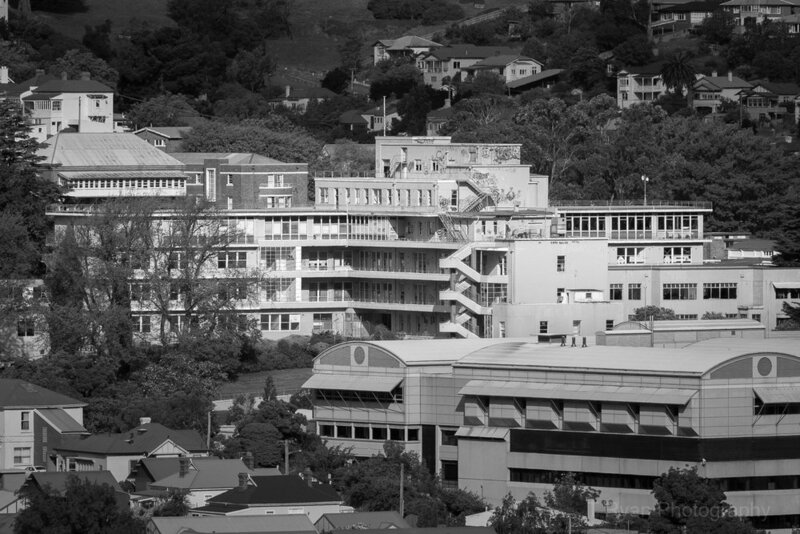 Photographing the old Launceston General Hospital put me in good stead for my storytelling projects into the future. Click here to view my collection of photographs I’ve edited so far of the former Launceston General hospital and other 20th Century Modernist hospitals over Tasmania.